Featuring a modern styling and an extra-large capacity that can accommodate your bigger weekend loads, this Amana NED5100TQ electric dryer is one sensible appliance for your laundry room. It has an extra-large capacity that allows you to accomplish more drying in a short period of time. The Automatic Dryness feature helps prevent overdrying so your clothes come out perfectly dried and wrinkle-free. This dryer has a host of attractive features, and among its most reliable feature is the Automatic Dryness option. This option helps control the temperature and level of drying to that clothes, which are already dried, are not subjected to overdrying. This smart dryer monitors the temperature so that the clothes are no longer subjected to high temperatures, especially when already dried. More than the 5 different cycles, this dryer also has 3 different temperatures so you can choose which temperature suits certain fabric. Certain fabric types require higher temperatures for drying, while others require only very minimal heat. These three different temperatures are perfect in choosing the right temperature level. Another practical feature of this dryer is the End of Cycle signal. This lets you know when the load is already complete so you can maximize your drying time. It allows you to accomplish more tasks in a given time. Once the End of Cycle signal beeps, you can start unloading your dried clothes and fabric types from the dryer. The exterior features of this Amana dryer are just as commendable. 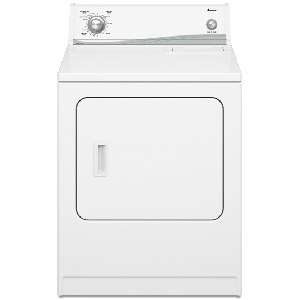 Its white exterior styling lends the dryer a clean and elegant look, making it perfect for your laundry room. The contemporary look makes this dryer ideal for your home. Since it has an extra-large capacity, you can accomplish more drying in lesser time. Plus, the left side swing door allows you to load and unload easily as well as to install the dryer without any hassle. Get a chic and contemporary dryer for your laundry room with this reliable electric dryer from Amana. Accommodate more clothes on a single load with the Extra Large Capacity of this dryer. Help keep your clothes in better shape as the Automatic Dryness Control helps prevent your clothes and fabric from overdrying. Know when the load is already finished just by listening to the End-of-Cycle signal. Choose from the 3 different drying temperatures as you dry all your clothes. Some consumers have complained how this dryer emits a humming sound while the drying operation is still in progress. This dryer does not have a drying rack, which is often considered to be useful in drying, especially with delicates and undergarments. There have been some complaints as to the slow heating capabilities of this Amana electric dryer.